Chlorine is one of the most reactive gases and belong to the halogen group of periodic table. It was discovered as a distinct element in 1810. Chlorine compound, sodium chloride (table salt) has been known by human civilizations since prehistoric times and evidence of use of rock salt have been found from as early as 3000 BC . 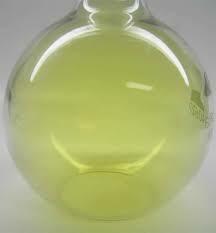 Elemental chlorine was isolated for the first time in around 1200, when aqua regia was discovered and was used to dissolve Nobel metals, like gold. Chlorine is released when gold is dissolved in aqua regia, however, it was not identified or studied at that time. Later in 1630, Jan Baptist Helmont proposed that chlorine is a gas, and not an oxide of an element. Later, Swedish chemist, Wilhelm Scheele, put forward a detailed study on the novel compound in 1774 and named it as, dephlogisticated muriatic acid air (muriatic acid was name of hydrochloric acid). The discovery of chlorine as an element rather than a compound was made by Sir Humphry Davy in 1810. The name chlorine has been derived from khloros, that is Greek words for pale green color of chlorine gas. Chlorine is an abundant element. It is the 21st most abundant element in the earth’s crust and makes about 126 ppm of Earth’s crust. Chlorine does not occur in free form in nature. It is found as ionic compounds of chloride in the Earth’s crust. The most common mineral is halite (sodium chloride), while other minerals include sylvite (potassium chloride) and carnallite. The dissolved chloride in sea water makes the biggest natural reserve of chloride, including the Dead Sea (Israel) and Great Salt Lake (Utah) . Among halogens, chlorine is the 2nd most abundant element after fluorine. Elemental chlorine is artificially produced from electrolysis of brine at commercial level. Chloride ions are ubiquitous in all living organisms. Inside the cell, chloride ions function to maintain a balanced environment of negative ions against the positive potassium and sodium ions. Elemental chlorine, in very small quantities is produced during an immune response of white blood cells against bacteria by the oxidation of chloride. Chlorine compounds, chlorofluorocarbons are present in high quantities and damage the ozone layer, eventually increasing the global warming. According to an estimate, around 40 million tons of chlorine gas is made each year from brine. Chlorine is a non-metal. It is a greenish yellow dense gas and has a pungent smell. The boiling and melting point of chlorine is also intermediate between fluorine and bromine. Chlorine has a diatomic molecular structure, that is why its heat of vaporization quite low, which lead to high volatile nature of chlorine. Chlorine becomes colorless at low temperature (-195C) . Chlorine is a very poor conductor of electricity. Chlorine is a very reactive non-metal and has a reactivity that is intermediate between fluorine and bromine. Element chlorine is a strong oxidizing agent, however, among halogens, it is still weaker than fluorine but stronger than bromine. Chlorine can readily react with almost all elements in the periodic table to form binary chlorides, except for oxygen, and the Nobel gases (excluding xenon). Chlorine reacts with hydrogen to form hydrogen chloride (HCl), which has a wide range of industrial and laboratory applications. Chlorine oxides are highly unstable, and all are extremely exothermic. Organic compounds of chlorine, C-Cl bonds are quite common and are considered as a common functional group in organic chemistry. Several organochlorides have been found in human, animals, plants as well as bacteria . Chlorine is abundantly used making synthetic polymer, polyvinyl chloride (PVC). PVC is used in making a wide range of products, including water pipes, car interiors, vinyl flooring, insulations of wire and blood bags. Chlorine is widely used as a disinfectant as it can kill various kinds of bacteria. It is commonly used as a water disinfectant. Chlorine is used in the manufacturing of paper and in textile industry. Chlorine is used in paints. Chlorine is used in making insecticides and pesticides. Chlorine is widely used in pharmaceutical industry for the manufacturing of large range of medicines, chloroform and disinfectants. However, due to the toxic effects of chlorine, its use has been greatly limited. Chlorine is highly toxic. It is used to in various chemical weapons. During the First World War, various chlorine-based weapons were used. Chlorine gas was also used in Iraq bombing, 2007 killing many people. Exposure of chlorine gas lead to irritation of eyes and nose, severe breathing difficulty and suffocation. Chloride ions are essential for maintaining a healthy body, and a daily dose of around 3-6 grams of salt is recommended. Chlorine has two stable isotopes, chlorine-37 and chlorine-35, where chlorine-35 is more abundant (76%). The radioactive isotope, chlorine-36 is the most stable chlorine.
. “The earliest salt production in the world: an early Neolithic exploitation in Poiana Slatinei-Lunca, Romania”. Archived from the original on April 30, 2011. Retrieved 2008-07-10.
. Gordon W. Gribble (1999). “The diversity of naturally occurring organobromine compounds”. Chemical Society Reviews. 28 (5): 335–46. doi:1039/a900201d.